Let’s get started with your event at A Good Space! Congratulations and welcome to A Good Space! We are so excited to have you on board as a Good Starter! In this page, we’ll share the steps you can take to begin co-hosting your first event with us. As we are a small team of just 2 (at this point of writing), we’d greatly appreciate your help in following these steps to ensure a smooth experience as you prepare for your event. Should you run into any obstacles, feel free to email Vincent at vincentng@nvpc.org.sg. Thank you! Have an event idea in mind? Here are a few simple steps you can take to set up your event with us at A Good Space. The first step is to check if our spaces are available for booking at the date / time of your choice at the calendar above. If there are no bookings on the date / time, then it is likely that the slot is free for your booking. What social issue (s) does it address? How does it expand perspectives towards a social issue (s)? Please email the above information to Vincent at vincentng@nvpc.org.sg. We will check on the availability of the space and get back to you via email or Whatsapp within 3 working days or earlier. Your event is now tentatively confirmed! The next step is to create an event page on Peatix. This allows you to build your community on Peatix and helps us to spread the word for your event to reach more people in the A Good Space community. In your event description on Peatix, please insert A Good Space’s logo which you can download here: PNG Format or JPG Format. 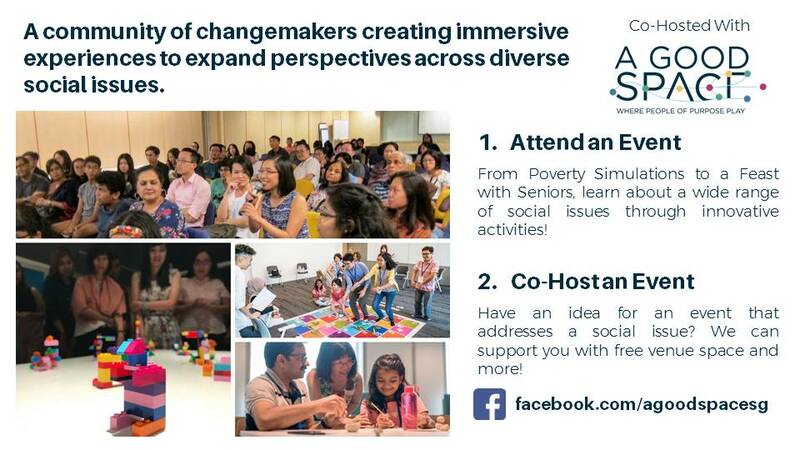 This event is co-hosted with A Good Space – where changemakers flourish as a community to imagine and create experiences that expand perspectives across diverse social issues. In registering for this event, you consent to the collection and processing of your personal information for the purposes of this event only, in accordance to the Personal Data Protection Act (2012). I consent to be added to A Good Space’s mailing list to receive a weekly email update on upcoming events, talks, films, experiments and activities around social issues at A Good Space. I understand that I have the right to unsubscribe at any time. What are your current views towards [insert social issue here e.g. climate change]? Share with us in a few sentences. What is one thing that you’d like to takeaway from this event? Feel free to add your own questions too! We just need responses to the above questions. For a step-by-step tutorial on how to create an event page and pre-event survey on Peatix, please watch the video above. Next, create an event page on Facebook and add A Good Space as a co-host. This’ll help your event to automatically appear in A Good Space’s Facebook Event Calendar to reach more people. Note: You have to create this event page using a Facebook page, not a personal profile. Otherwise, you would not be able to add A Good Space as a co-host. For a step-by-step tutorial on how to create an event page on Facebook and add A Good Space as a co-host, please watch the video above. Is this your first time attending an event at A Good Space? On a scale of 1 to 10, rate how satisfied you are with today’s event. What is one action step you can take immediately in the next 3 days? What is one area this event can improve on? On a scale of 1 to 10, how likely would you recommend this event to a friend or colleague? This helps us to get feedback on the event and also to track an expansion of perspectives in the participants. For a step-by-step tutorial on how to create a post-event survey, please watch the video above. Click the link on the below. It’ll take you to a pre-event checklist, which will ask you for the links to your Peatix and Facebook events. Once you have completed this checklist, your event is confirmed. If there are people who walk in, please ask them to register through your Peatix page so that we capture their contact information. This event is co-hosted with A Good Space, which is providing the venue for free. 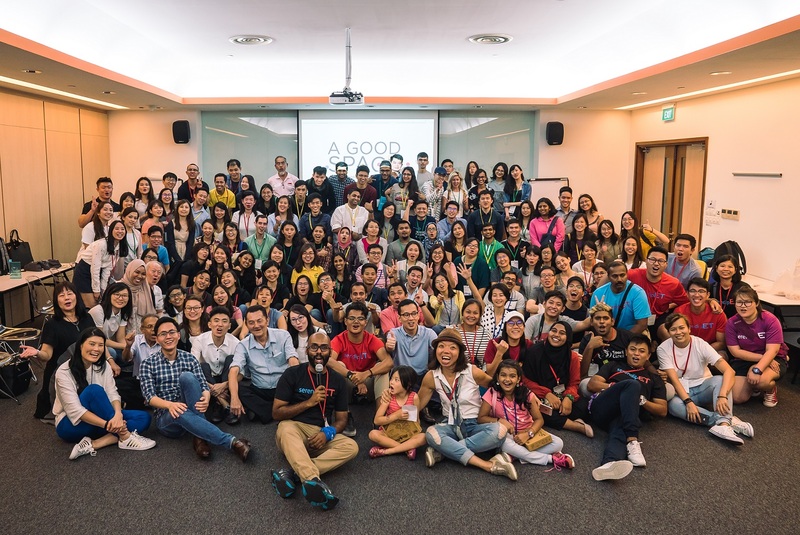 A Good Space is a platform where changemakers flourish as a community to imagine and create experiences that expand perspectives across diverse social issues. From Poverty Simulations to a Feast with Seniors, you can learn about a wide range of social issues through innovative activities. Have an idea for an event that addresses a social issue? They can support you with free venue space and more! Can I now invite you to take out your mobile phones, go to Facebook, search for A Good Space, and like their Facebook Page to be the first to be notified of upcoming events like this. If you are using slides, please also include the slide shown in the image above in your presentation. Thank you. At the end of your event, remind your participants to take out their mobile phones to do the post-event survey on the spot. Typically, it’s quite difficult to get them to complete the survey after the event so we highly encourage you to get them to do it before they leave. 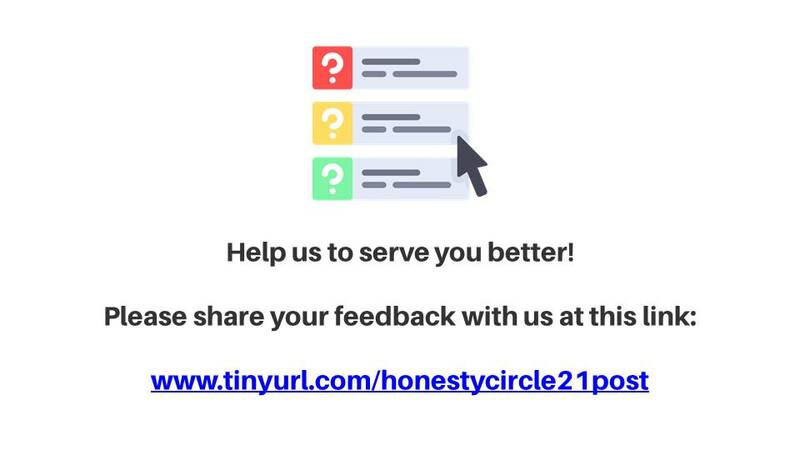 It might be helpful to flash the post-event survey on a slide, with the link clearly represented, as shown in the image above. In 1 sentence, could you tell us what the event was all about? What is one new thing you’ve learnt today? This could be shot using a mobile phone or camera. For an example of an attendee story, please watch the video above. These videos can be used to entice more participants to come for your events in the future. Please email the above information to Vincent at vincentng@nvpc.org.sg no later than 3 days after the end of your event. Thank you!